Students identify and apply rules for pronoun-antecedent agreement. Then they identify the difference between active and passive voice. Next they develop an editing checklist. Finally, they edit an excerpt. In this experience, students identify and apply rules for pronoun-antecedent agreement. Then they identify the difference between active and passive voice. Next they develop an editing checklist. Finally, they edit an excerpt. Note that additional rules are covered in the experiences Capitalization and Punctuation and Commonly Confused Words. Identify and edit active and passive voice. Writing is a process. After you have written and revised your text, the next step is to edit it to fix any errors. In this experience, you will learn what to look for during editing. The saying can apply to anything—like math homework, sports, and friendships. Explain how the saying applies to the writing process. 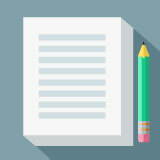 Lead a class discussion about “mistakes” and the writing process: drafting is for putting ideas into words, even if there are errors in organization, structure, and language. The errors are expected and respected. Revising is to fix the big mistakes. Editing is to fix the smaller errors. In these steps, the errors are inspected and corrected.